“Base Work” is the most comprehensive instruction on building and performing with an illusion deceptive base. The deceptive base is the single most important utility in illusioneering and is required education by all serious students of illusion. 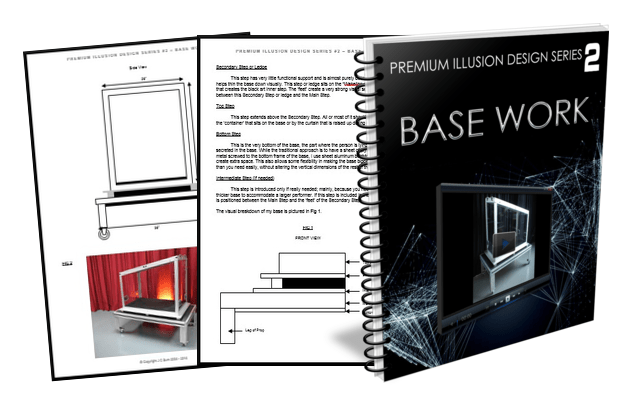 This volume in the premium illusions design series details everything you need to know about understanding, building and working with a modern deceptive base. Also included is the detailed construction of J C’s original modern base design that is highly deceptive, durable but yet very lightweight. Receive a US$30 rebate if you previously purchased the original base work plans or Illusionary Departures 2012, Ultimate Illusion Collection or The Complete Illusion Library. Note: This is an Illusion Plans PDF for downloading as well as Video Streaming Link. Access link will be automatically emailed upon payment confirmation. Streaming Video is for streaming online only and will not be provided as a download.